Have We Disintegrated Mission and the Gospel? A Singaporean Christian was on his way for a short-term mission trip to a village outside Phnom Penh. He saw an injured man lying along the road. 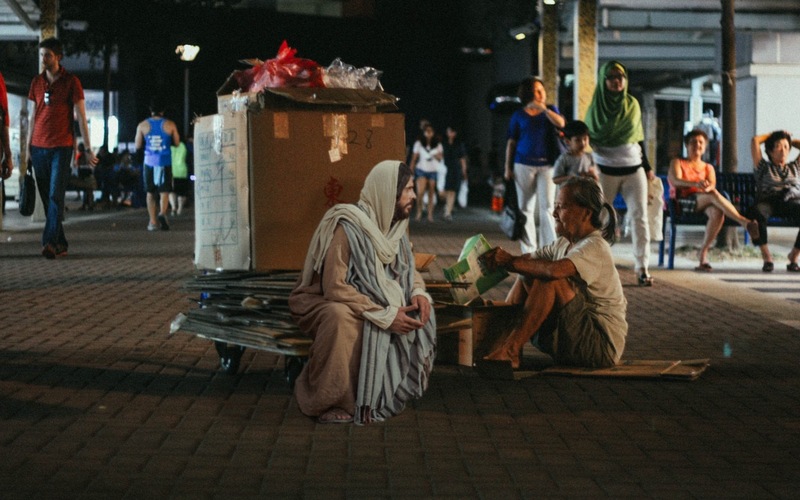 He thought to himself, if I can preach the gospel to him after I help this man, then I will go help this man. As he approached the injured man, someone else came and tended to the man. So the Singaporean stopped in his track, and continued on his way to his short-term mission trip. Was this Christian a Good Samaritan? No? But that’s what many Singapore Christians and churches do in missions–a false view of missions which we inherited unthinkingly. First, many think missions is only verbally preaching the gospel. Any social action is instrumental to that end. That’s like saying my neck only exists to hold my head; I can make do even if I chop off my neck. But that’s not how the Scriptures present the disciple’s role. We are to love God and love neighbour first and foremost. We become the Levites who walked away from the injured victim on Jericho when we say we only do good works so that we can bring a good word. An outflow of loving God and neighbour is to make disciples of all nations (Matthew 28:19-20) and be witnesses of Jesus to the ends of the earth (Acts 1:8). Isn’t it hypocritical to teach disciples to love their neighbours when we don’t first love them as an end in itself? Second, many think the gospel is only Jesus dying for our sins that we may be saved to heaven. That is also why we think missions is only about verbally preaching that message, because we think that’s the necessary and sufficient message. That message is so narrow it’s like ordering chicken rice without chicken or rice; you just get chilli and cucumbers and call it chicken rice. The gospel Jesus preached was not that message. Jesus preached the Gospel of the Kingdom of God (Matthew 4:17; Luke 4:43; Mark 1:15; John 3:3). This Gospel is not as neatly spelt out in the gospels or the epistles like in 1 Corinthians 15:3-5. This Gospel is the whole will of God from Genesis to Revelation: Creation, Fall, Redemption to New Creation. The Gospel is that God is bringing everything in existence under the Kingship of Jesus (Colossians 1:15-20). And Jesus presented this Gospel by not only verbally proclaiming the message of forgiveness of sin that we may be reconciled to God, but also demonstrating the message of His Kingship and the reign of His Kingdom by healing people of sicknesses and liberating people from bondages (Matthew 4:23-24), showing His authority over nature (Matthew 8:26). Jesus was showing us a foretaste of the Kingdom. The Kingdom was there and then. But the ultimate thing was yet to come. 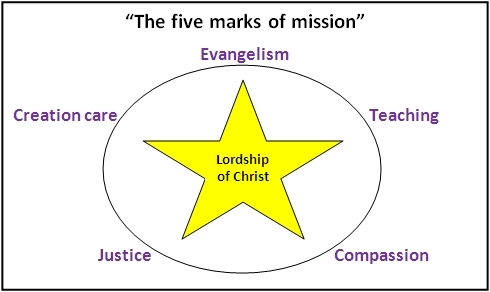 So integral mission is both the proclamation and demonstration of the Gospel of God’s Kingdom, bringing the Gospel to the nations by both good works and good words, integrated together. This is not unorthodox. The late evangelical leader John Stott was key to framing this view of mission: see “International Consultation on the Relationship between Evangelism and Social Responsibility”, Evangelism and Social Responsibility: An Evangelical Commitment (Grand Rapids, Michigan, June 19-25 1982). Integral mission is, in the words of a friend, integrity between the message, the messenger and the method. Our message of the whole Gospel of the Kingdom has to be brought forth by a messenger who is in the first place living a life under the Kingship of Jesus, and the method must be integrated: the message must shape the method; the method must reflect the Kingdom. An Indian administrator of a hospital shared about how he once refused to bribe the local Hindu government officials to grant the necessary licences and explained that he was a Christian. They initially refused to grant the licences. Then, a miracle happened and they convened a special meeting to pass an exception to grant the licences. Integral mission means that when we demonstrate the Kingdom of God to a community, we must imagine what the Kingdom of God could look like tangibly for that community. It could mean no more sanitation-related diseases. Or it could mean meaningful occupation, paid or unpaid, for every member. Or no more hunger because of crop failure. As we work towards bringing a foretaste of the Kingdom to people, we must also point them to an ultimate vision of the ultimate Kingdom, which can only be entered into through Jesus. And how can they enter if we don’t tell them about King Jesus and His Kingdom? But we often disintegrate this integral mission. We do either evangelism or social action but not both. Or even when both, it’s merely functional. Or we do compassionate ministries but eschew justice work. Or we say creation care is merely for tree huggers, a good to have. Or we plant churches but don’t do discipleship. So the Christians fall away or continue to live unrighteous lives. I heard an anecdote about a community development NGO partnering with a church-planting mission who successfully planted churches and partnered with the community in development. But several years later, the community was in a worse state: people were getting drunk in the morning, children were neglected, community health was deteriorating. Without discipleship, there can be community development or even churches but there will be no communities of righteousness. And whatever good work whether physical or spiritual will not last. One might say, but Jesus didn’t do things like fight for just social structures, implement vocational training, bother about creation care, and any other social action. But Jesus did say greater works than His would His disciples do (John 14:12). It is significant that the apostle Paul’s first missionary journey was not in fact a preaching one but famine relief to needy believers in Jerusalem (Acts 11:27-30). The early Church did many good works which expressed the semblance of Kingdom of God within their context. And yes, that included the justice work of redeeming slaves. So it seems to me we contextualise everything except when it’s inconvenient to do so. 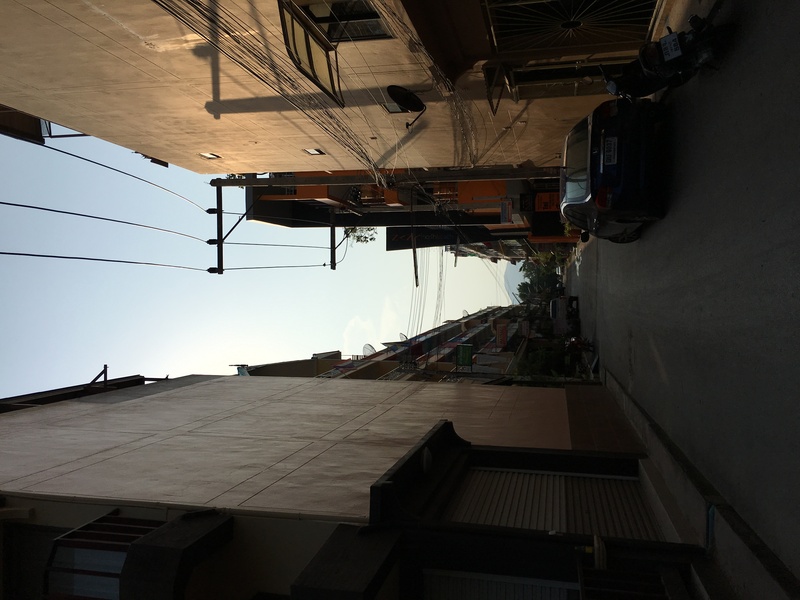 Third, many think missions is only when it’s cross-border, cross-cultural. I was told by a friend who works with university students that many think this way, only because their church espoused this. That’s like saying I am only a Christian in church on Sunday and an atheist in the workplace Monday to Friday, sometimes Saturday. Actually, I’ve heard of people who are pastors on Sundays and terrorizing clients to service providers every other day; my interior designer friend shared such horror stories with me. So we think we stop participating in God’s mission of bringing the whole world under the Kingship of Jesus when we are in Singapore, when we are relating to people of the same culture as us. So we spend lots of time, money, effort organising a 1-week short-term mission trip to places like China, but when it comes to PRC workers in the construction site right behind our church, that isn’t missions. Or you may say no, I do marketplace ministry. Is your idea of marketplace ministry singing Christian songs and doing Christian devotions and sharing in your office? That’s good. But what about what you say during corporate meetings and explaining your decisions at work? Or how you relate to your employees or vendors? Every thing we say or do, wherever, whenever, is either a witness to Jesus, or a witness to our practical atheism. This is no different in church, in the workplace, or in the mission field. 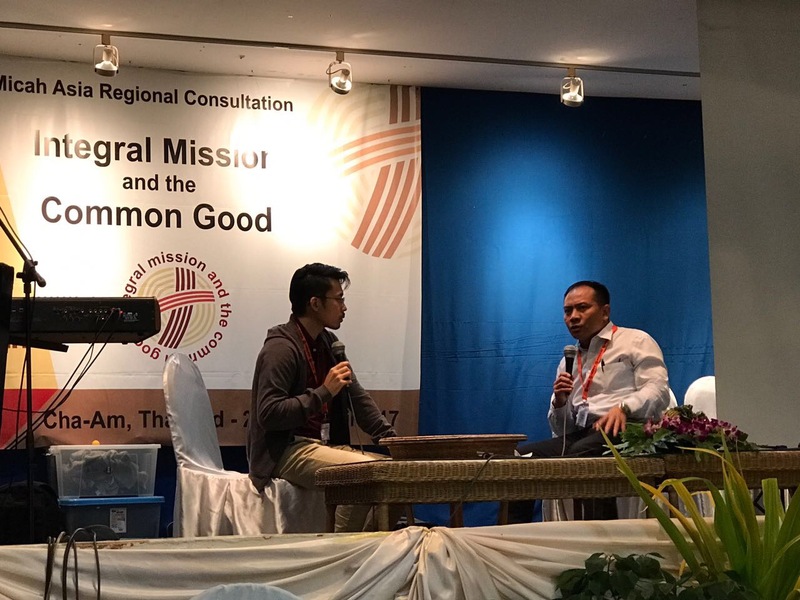 As I write this, I am at the Micah Asia Regional Consultation in Thailand. I’ve heard stories from Christians all over Asia doing integral mission by (among others) providing care to refugees in Malaysia, healing and hope through a mission hospital in Uttar Pradesh, political engagement in the Philippines, microfinancing, vocational training and career guidance in Assam, India, mentoring youths to become “alongsiders” or adoptive siblings to needy children in Cambodia, community health education on leprosy through a coalition of churches in Sri Lanka, anti-corruption political campaigning in Nepal, political engagement on homelessness in Melbourne. These people are pursuing integral missions, but they too need to partner with churches and other people to do it more holistically: to disciple, to evangelise, to build communities, to fight injustice, to do compassion ministry, to steward creation. As I heard these stories, the word of one speaker, CB Samuel, kept ringing in my mind: integral mission is giving people the freedom to dream. I am told that many Singaporean Christian university students are stuck on the same rats’ race of conventional societal norms of success: find a decent-paying job, live a decent life, travel, live old, then die happy. I am told that the young people of developing countries like India, Philippines, Sri Lanka, Nepal, also share similar visions, albeit they are more quickly disillusioned because of the lack of opportunities there. If King Jesus lived and sacrificed so much only so that we have such a vision for our lives, then I’d say we Christians are to be pitied. But He did not. He came and suffered much to give us a glimpse of His ultimate Kingdom. It is we who do not see. The ultimate vision of God’s Kingdom has been given in part in the Old and New Testaments (Isaiah 65:17-25; Revelation 21:1-4). A Kingdom where there’s no pain, no sickness, no death, no conflict, no lack, where there’s reconciliation and right relationships between people, between people and nature, and between people and God, and all things are reconciled in and to King Jesus. The rest of the details are left to our sanctified imagination. And to glimpse at this ultimate Kingdom, we need to have the freedom to dream, to imagine. But we are often limited in our imagination, because at some point in our lives, our dreams were denied. For people and communities who are much less privileged than us, this is even more true. So we need to have biblical imagination, and help people around us, especially those less privileged who have been denied the freedom to dream, to also have such biblical imagination so that they can not only taste a foretaste of the Kingdom of God here and now, but dream of the ultimate Kingdom. Then we, and they, will yearn for the Kingdom of God and for a community in communion with God. But I come back to where we are now. Have you disintegrated integral mission, disintegrated the Gospel, and disintegrated the Kingdom of God? If you have, what are you going to do about it today?